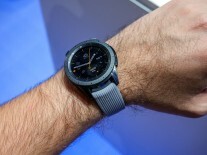 This is the Samsung Galaxy Watch. The casing comes in two sizes - 42mm and 46mm - and three colors - Black, Silver and Rose Gold, which is exclusive to the smaller 42mm size. 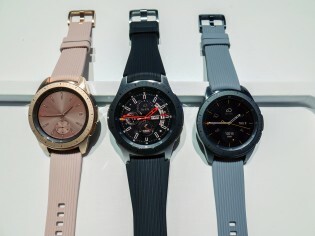 If you've owned a Samsung Gear S3 Frontier then the new Galaxy Watch will feel familiar. Its textured bezel rotates smoothly to navigate the interface and there are two rugged-feeling buttons on the side. The first button takes you to the homescreen while the second is a configurable button that can perform whatever task you set it to - open an app, start a workout, etc. 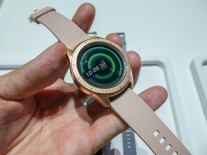 The display on the Galaxy Watch is a brilliant Super AMOLED that combines inky blacks with vibrant colors. 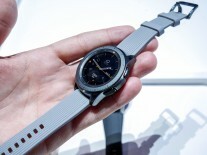 The larger 46mm Galaxy Watch has a 1.3-inch fully circular display while the 42mm has a 1.2-inch canvas. Both share a resolution of 360x360px, which offers tack sharpness of around 390ppi. The watch itself is made with high quality metal that feels premium and durable. The default bands however are cheaper-feeling rubber that we'd swap out immediately for a softer material (like leather). The interface navigates smoothly. We didn't notice any slow downs or hiccups. 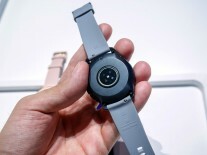 And while we couldn't test the battery life during our few minutes of hands-on time with the Galaxy Watch, we were told by Samsung reps to expect up to 4 days worth of endurance - that would be game changing. 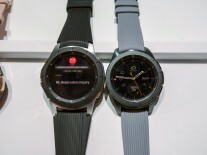 We'd expect the smaller 42mm Galaxy Watch to last less than the 46mm one, given the battery size difference. 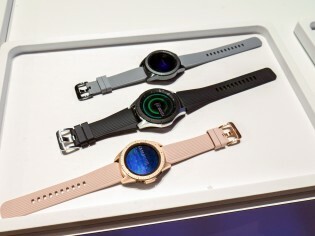 Whichever Galaxy Watch casing color you go for you'll get a black plastic bottom plate (which holds the heart rate sensor) and a darker rotating bezel. 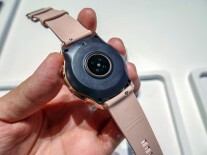 It gives the watch a slight two-toned look. We liked the Silver model the most. 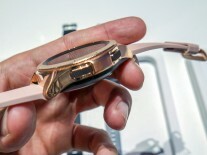 Fans of pink or rose devices would need to see the Rose Gold Galaxy Watch in person - it's a specific shade of the color that might not appeal to everyone. 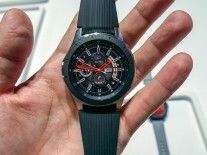 We'll try and get a hold of the new Samsung Galaxy Watch soon. 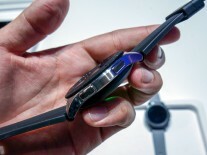 Samsung Galaxy Watch is 50m waterproof, and is HR Sensor is different. I hope more precision in this point. Color and appearance in 46mm must be S3 Gear, is fantastic.